All it took was one night...one night spent with Pinterest to get me hooked. I downsized my outrageously long browser bookmarks list and placed them all neatly categorized on Pinterest. (it's much easier to scan the photos for what I want than to search through a list of obscure links). I re-pinned the fabulous ideas other people had found (saved me the work of finding them). I was so inspired by all the crafts, projects and foods I saw that by day two (yeah...day TWO) I told Mr. LH I'd do better if instead of being on Pinterest searching for projects I was actually DOING those projects instead. So I started. 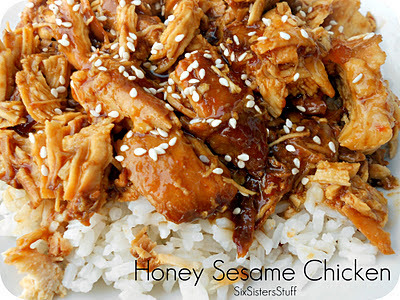 The first thing I tackled was a Crock Pot Honey Sesame Chicken recipe from SixSistersStuff.com. Doesn't it look just YUMMY? I LOVE sesame chicken. If I go to a Chinese buffet, I'm all over the sesame chicken and crab rangoons! I knew I had to give this recipe a try. I had to go to the grocery store anyway because a huge snowstorm was forecasted that would keep us indoors all weekend. I took that opportunity to make sure I had everything needed to make the Sesame Chicken. I had the chicken in the crock pot by 1pm and it was ready by dinnertime. All I had to do extra was make some rice in the rice cooker and steam some broccoli. It was one of the easiest recipes I've made! The chicken was very tender and the "Pickles" cleaned their plates. I did lessen the amount of honey in the recipe to 3/4 cups instead of the 1 cup called for. On to the next "pin"spired project!